Will Anyone Notice That You Got Dental Implants in Brookfield? When people consider dental implants, one of their first questions is “How noticeable will they be?” This is an understandable question because once all is said and done, meaning all the preparatory exams and procedures are completed, the surgery is performed, and all the follow-up appointments are finished, the last thing you’d want is for your new tooth to look unnatural. Thankfully, dentists know all the steps to making sure your tooth is not just a part of your smile, but a part of you in general. Here’s how dentists make dental implants in Brookfield look natural. When people hear that a titanium implant is what’s used to replace the tooth root, they’re often confused as to what that means for their appearance. Titanium is one of the few materials that is incredibly durable and also biocompatible with the human body, meaning your mouth won’t reject it once it’s placed. 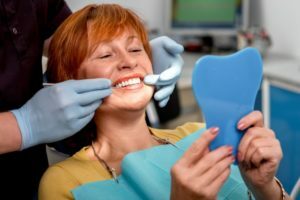 If for any reason the dentist feels that your implant would be visible through your gum tissue, they can always opt for materials that blend in with your facial tissue as well. Furthermore, the only way someone could tell if you have an implant is if you previously had many missing teeth and those around you were aware of it, or if a dentist used a radiograph to examine the roots underneath your gums. Just like if you were going to get a filling or dental crown, dental implants give you the option to use tooth-colored materials to blend in with the rest of your smile. To do this, all-porcelain, implant-retained dental crowns are affixed to the top of the implant with an abutment. Keep in mind that the abutment, which is a screw that affixes the restoration to the implant, is entirely covered by the restoration. This is the case regardless of the implant that you choose, including single tooth replacements, implant-retained bridges and dentures custom-made to fit with implants. Prior to placement, these restorations are all custom-shaded and shaped to look natural. To do this, they need to be not too white, which could cause them to look like “chiclet-teeth,” but also not too yellow so they end up looking stained. Dentists always take this step deeply into consideration. Finally, it’s common for people to ask if dental implants will feel like real teeth. The important fact to mention here is since the tooth root is replaced and not just the crown, biting, chewing and grinding will all feel 100 percent natural. The alveolar bone that surrounds the tooth root has fully integrated with the implant at this stage of treatment, therefore making it feel indistinguishable from natural teeth. When it comes to the look and feel of your smile, no other tooth replacement option comes close. Schedule an appointment with an implant dentist in Brookfield today to learn if dental implants are for you! The dentists at Elmbrook Family Dental are fully qualified to make your dental implant look as natural as possible, regardless of how extensive your tooth loss may be. By utilizing the most cutting-edge cosmetic techniques and obtaining the highest quality materials available, you can rest assured that your smile will look natural by the end of treatment. To learn more about the practice, you can speak to any one of our exceptional dentists or team members by contacting them through their website. Comments Off on Will Anyone Notice That You Got Dental Implants in Brookfield?